2.8mm Fixed Lens, f/2.0 Max. 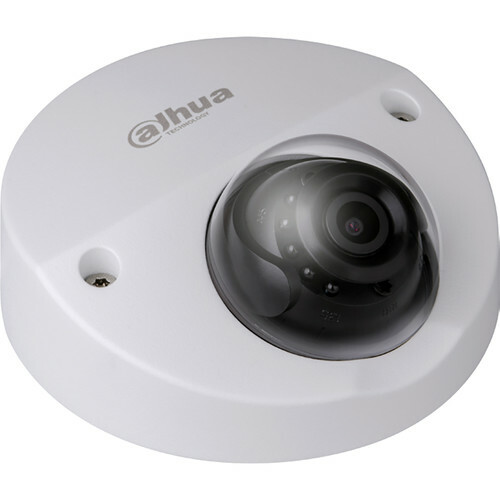 Capture 4MP security video with the Mobile Series DH-IPC-HDBW4431FN-M 4MP Outdoor Network Wedge Camera with Night Vision with RJ45 connector from Dahua Technology. Featuring a 1/3" CMOS sensor and a 2.8mm fixed lens, this compact camera can record video at resolutions up to 2688 x 1520 at 30 fps in a 104 x 57° field of view. The camera has IR LEDs for night vision with an effective range of up to 65'. Image enhancement features including a 120 dB wide dynamic range, automatic white balance, and backlight/highlight compensation enable you to capture clear images in varying lighting conditions. Designed for easy setup, this camera incorporates PoE technology so you can run just one cable for both data and power. A built-in microSD card slot allows for edge storage, while a built-in microphone enables audio capture. The camera is rated IP67 and IK10 for weather and vandal resistance. ONVIF compliance ensures compatibility with a wide range of surveillance equipment.